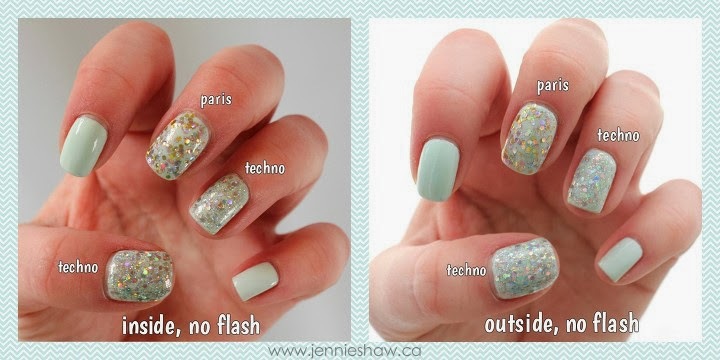 jennie's nails and tales: the nail files: all that glitters isn't gold…it's silver, too! the nail files: all that glitters isn't gold…it's silver, too! 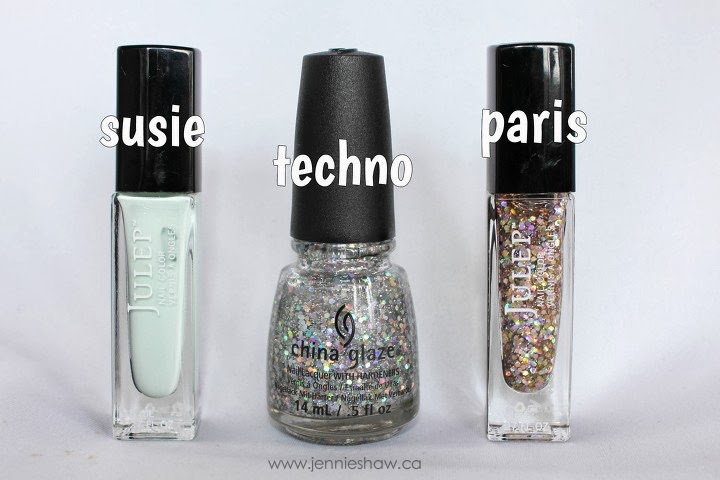 My favourite hex glitter of all-time is Julep's Paris. The moment I first laid eyes on it, I was all I DON'T EVEN CARE WHAT THAT COSTS I MUST HAVE IT AND I MUST HAVE IT NOW. Luckily, it was part of everyone's Maven box of the month. Since then, I've bought another bottle and I'm seriously thinking about getting a third, just in case they stop making it. And then, just when I thought that it wasn't possible to get better than Paris, China Glaze came out with some new staple colours and they have a hex glitter named Techno, which is EXACTLY the same as Paris, only silver. I did a mani with both, so you can see just how pretty these two glitters are. GAH I JUST LOVE THEM BOTH SO MUCH!! IT'S TOO MUCH PRETTY TO HANDLE! So if you're in the market for an awesome hex glitter, look no farther than Paris and Techno! HEX GLITTER FOR EVERYONE! Haha!! Have an awesome weekend! And don't forget to link up and make the rounds to see what everyone's rocking! OH. EM. GEE! I am in LOOOOOOOOVE with both of those glitters. I mean FOR REAL! I might run off into the sunset with them! Also--happy Friday, friend! I hope rewrites are going really well! 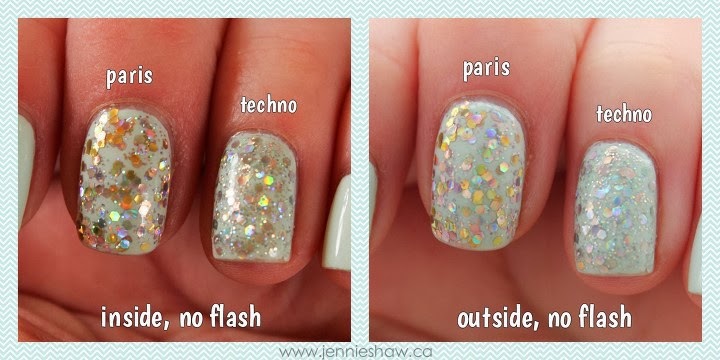 I LOVE THIS MANI JENNIE. So glad you did the close up shots too - I'm surprised that's only two coats of each glitter! That's great coverage! Also, your GIFs are zee best. I like Paris better. No, wait...Techno. No.....Paris. Or....Techno. GAH! Love your post title! Both of those glitters are very nice! I really like Suzi. Still need to get some Julep polish. I got some light green OPI today for St. Patrick's day though. P.s. I love Kim & Housewives of B Hills. Loveeee! I have a severe addiction to all mint polishes & glitters, so I absolutely love how this turned out! Oh my gosh! I love your nails! Their gorgeous, cute color too! Thanks for hosting the nail link up and enjoy your evening.